We were able to save money on the trip by visiting local markets and purchasing ingredients to prepare the day’s meals. Traveling from town to town without a cooler meant having to make daily trips to the markets to purchase ingredients. Although the towns we visited had grocery stores, similar to those we would find in the United States, we chose to do most of our daily shopping at individually owned markets. In most cases we found the items at these quant markets to me less expensive than those found at the large grocery stores. There were a few items, like yogurt, we purchased from the grocery stores as they offered a larger selection to choose from. We traveled throughout Chile in February and March, the beginning of fall, and this meant freshly harvested produce could be found at the local markets inexpensive. We were able to easily find everything from apples and blueberries, for breakfast, to squash and peppers, for dinner. Many of the larger markets, like the ones in Valparaiso and Valdivia, provide multiple vendors to choose from which allowed us the opportunity to be more selective in the produce we purchased. 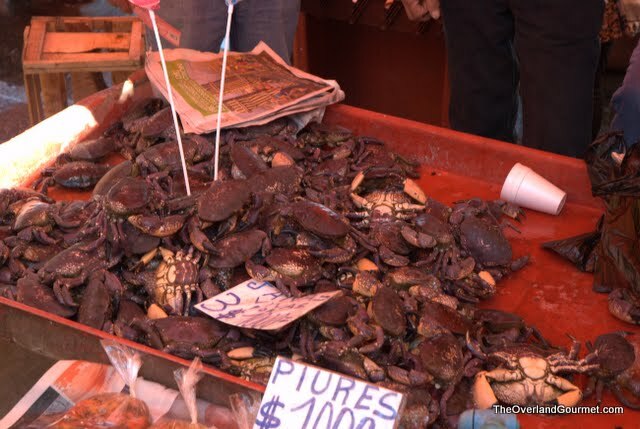 We were excited when we began planning our trip because Chile is a very narrow country, approximately 250miles at its widest point, and we expected to find seafood markets in every town we visited. We soon discovered this not to be the case and instead observed these markets, and even seafood on menus, to begin trailing off after we traveled 30 to 50 miles inland. We even encountered this between Valdivia and the coastal towns of Niebla and Corral, 11 miles away, and were told to purchase seafood from vendors on the coast as it would be fresher. The coastal seafood markets we did walk through offered a wonderful assortment of bivalves, fish, and shellfish. For those, like us, who’s Spanish isnt the best, prices are clearly displayed and the fish mongers are friendly. We fell in love with Chilean cheeses and lucky for us cheese shops were easy to find! Signs along the highways would direct us to small ‘mom & pop’ stands selling assortments of cheeses. Our favorite cheese, which I believe to be Queso Chanco, had a mild, buttery taste and melted very well. Cheeses are stored at ambient temperature and ordered, as you would in a gourmet cheese shop here in the US, by the wedge. Another staple of the Chilean diet is bread. Knowing the German influence in much of the country, we expected to find artisanal bread shops like those we found in Germany. What we found most often in the independent shops was more akin to biscuits we would find in the United States. Our favorite bread was produced by a small baker in Pucon. Some would say her bread was made with love, I believe it was bacon grease, either way it was wonderful and would quickly sellout.